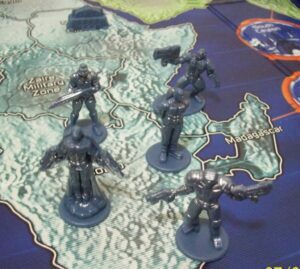 Review of Risk 2210 AD (risk 2210 a.d.), an innovative reworking of the classic game Risk. The classic form of Risk is hard to beat in the genre of strategy board-games, but it’s not alone. 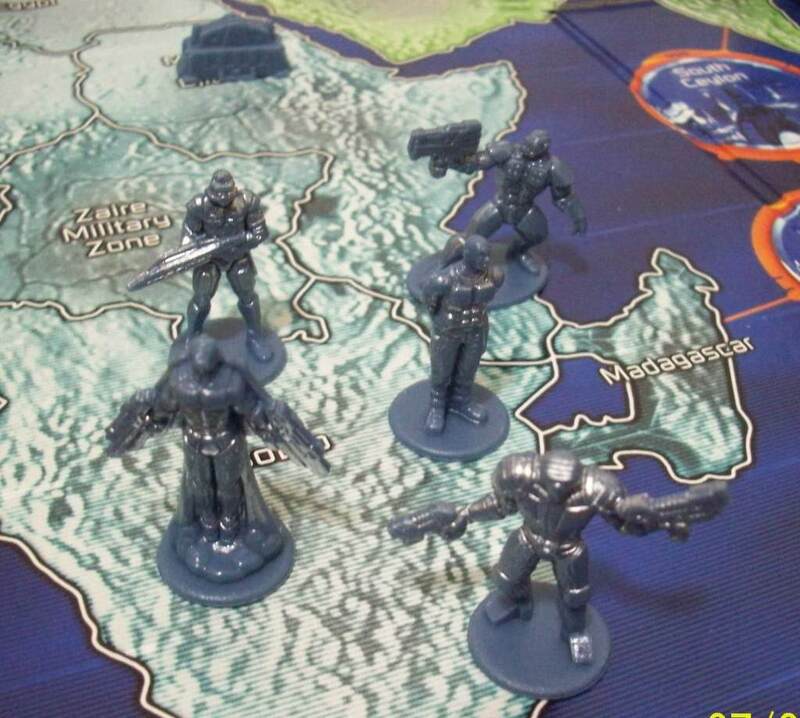 Due to the flexibility of the core game-play rule-set, the traditional world map can then be exchanged for a completely different world that lets you play Risk with friends in different ways. There have been plenty of variants that have come out over time. Due to the game’s popularity, it was certainly going to have a sci-fi version like this. 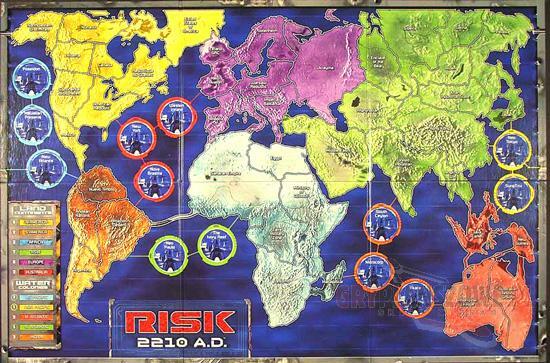 Risk 2210 AD is more or less the sci-fi version of the popular board game from Avalon Hill, first published back in 2001. If you have 2 to 5 players from ages 10 and up, then you can get ready for 3-4 hours of fun with your armies. It’s pretty much the same as classic Risk, wherein you acquire armies to attack and fortify territory. But what sets this game apart from classic risk is the inclusion of the Moon as a conquerable territory, thus adding another dimension to the strategy game-play. Not only do you have to worry about taking control of continents while preventing opponents from doing the same, but there’s a whole different territory outside the world map to deal with as well. It’s like a continent but with a different sort of restricted access to it. Being able to control the Moon in this game grants some pretty big advantages that can immediately bring you closer to victory. With that said, it means you can’t play it exactly like how you play classic Risk game. Thinking that you can just play it like classic Risk and not care about the Moon may not be the best mindset here. Not only is there a Moon to conquer, but you must also control the waters with your navy. Not only does it give all players an additional way to get around, but it also means that certain places in the map like Australia that were safe havens in classic Risk are not that safe anymore. Even the Moon itself isn’t that safe since everyone can get up there anyway. There are also no more Territory Card sets, so players who are winning in the late game can no longer flood the map with too many armies. This means players who are behind can still catch up, making the game a closer affair where anyone can win even in the face of defeat. For many players, this is their favorite part of Risk 2210 AD as these changes actually makes the game more fun in the long run. If you like playing Risk with friends, then this game should add a lot more to that experience. Then there are the Nukes, which are what really make Risk 2210 AD even more interesting than most other Risk variants. Players now have their own hit-or-miss gambit that can either finish things off and win in grand fashion or bring themselves to ruin. The Nuke is a super weapon that brings great reward, but also epitomizes the title of the game by letting you gamble everything on one shot for great rewards in exchange for relative safety. There’s much fun to be had in this game as there is more potential chaos. You get to play with 8-sided attack dice that go with the usual 6-sided dice, so you get to hit harder and more often once you have acquired commanders. Having a commander is perhaps what really makes Risk 2210 A.D. fun as it helps break stalemates, let winning players really drive home the advantage, and let losing players dramatically bounce back from the deficit. If there are drawbacks in this game, it’s mostly from not being able to aim Nukes and the Moon not being as exciting as it should be. It’s quite hard to get up there, with only 3 lunar landing sites that can only be reached from Space Stations, which are only usable if you have a Space Commander. Forces from the Moon can invade the Earth, but it’s a lot like the Nukes that you can’t aim at a specific target. As the name of the game suggests, there is a risk in every move. It’s a high-skill-high-luck game that does reward strategic superiority but also punishes complacency. It can then be aggravating for some who have the advantage to mess up due to a bad die roll while it can be exciting for others who are rooting for the last man standing somehow holding off a superior force with lucky die rolls. For experienced Risk players who may not be that happy about the additional rules in this game can still bring it back to the basics with the original rules if they wish since Risk 2210 AD is made of the components from the original. 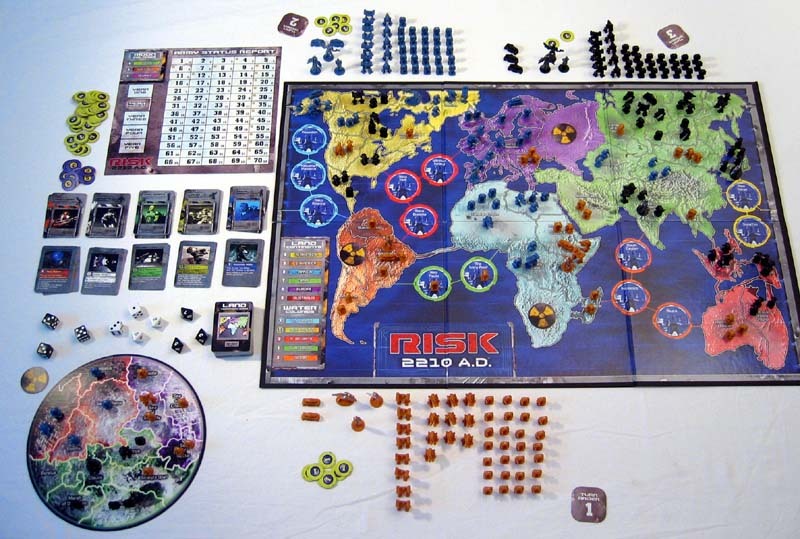 As for those who have been looking for a Risk game where controlling Asia does not make you the winner almost automatically, then you’ll definitely like Risk 2210 AD and its new rules.